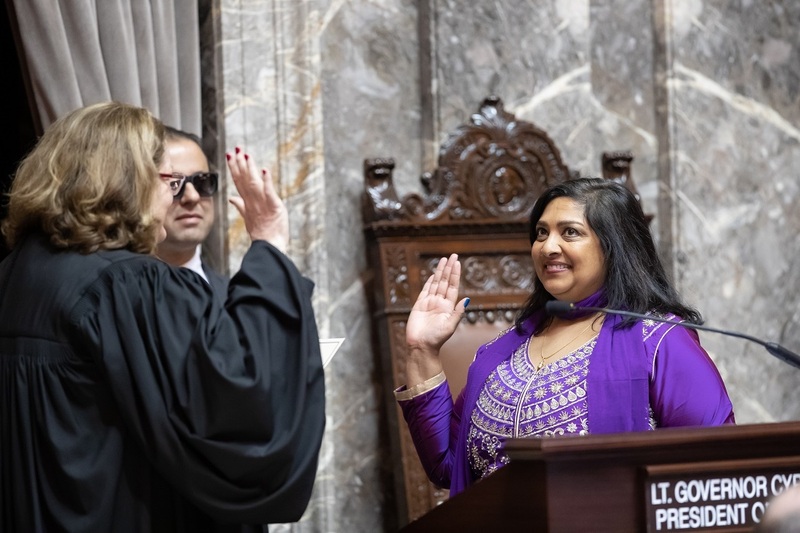 Indian American Mona Das being sworn in as a Washington State senator at the state capitol in Olympia on January 14. Das says show wore bright, purple kurta for the ceremony because she wanted to reflect her Indian roots. “It’s about time that we paid attention to things that matter in America, and I and hundreds of other women of color like me are poised to do just that,” says Indian American lawmaker Mona Das, who represents Washington’s 47th Senate District. Washington State Sen. Mona Das is about to complete her first month in office and she eels exceptionally proud of being a part of a historic political landscape in America that is more diverse than ever before. The Indian American lawmaker, who came to the United States when she was only 8 months old, says that she always has been a proud American — even though many told her that she didn’t look like one. Today, she says, that she is happy to be in a position from where she can make a difference for thousands of women like her. Das defeated incumbent Republican Sen. Joe Fain from Washington’s 47th district last November. Talking about her first month in the office and being amongst the new-age desi women who are coming into prominence in America now, Das says her journey has been an interesting and eventful one. Das’s parents came from the Munger district of Bihar, India. She says new-age politicians like her are immensely proud of their roots. In her case, it was evident during her swearing-in ceremony on January 14.